Contrary to its name, the Australian Gold Nugget is actually a large gold coin produced by the Perth Mint, one of the world’s most renowned mints. 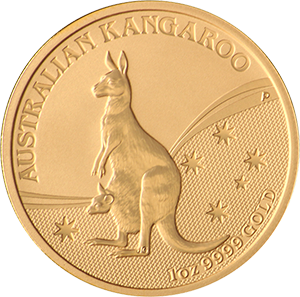 The Gold Nugget should not be confused with the Australian Lunar gold coins, which although have the same purity, have each year represented by the animals of the Chinese calendar and not the Kangaroo depicted on the Nugget. 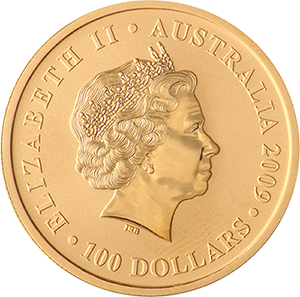 Denominations of the Australian Gold Nugget range from 1/oz to the enormous 1kg coin, and are considered as legal tender in the country. With the exception of the Chinese Panda, the Nugget is the only gold bullion coin that changes its design year on year. This makes it particularly popular with collectors, who often endeavour to accrue the whole set. The coins are thought to be among the most striking modern bullion, with two-toned effects and hard plastic coating. It’s uniqueness is considered one of the coin’s greatest strengths and it continues to grab worldwide attention upon its annual release. The 1oz Australian Gold Nugget has a diameter of 32.10mm and is 2.65mm thick, but it’s the coin’s 24 carat purity that makes it one of the most valuable items on the world market. With a face value of $100, its gold content, collectability, and the fact that such a limited number of coins are released each year, makes the coin a much more attractive investment than it’s currency value. In 2011, an enormous 1-tonne Gold Nugget coin was produced by the Perth Mint, a new world record for a gold bullion coin (previously held by the Royal Canadian Mint). The coin is almost a meter in diameter and 12cm thick. It was valued at A$3m at the time of its release and has a face value of A$1m.